Explore! 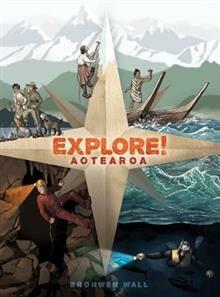 Aotearoa features the thrilling true stories of New Zealand explorers Kupe, Thomas Brunner, Freda du Faur, Kieran McKay, and Kelly Tarlton. Follow these adventure pioneers on a journey across the oceans, over the land, up the mountains, beneath the earth, and under the o... read full description below. "About the discovery and exploration of New Zealand by pioneering adventurers like Kupe, Thomas Brunner, Charles Heaphy, Kehu, the Graham Brothers. Freda du Faur, Kieran McKay, Wade Doak and Kelly Tarlton.It covers almost all of New Zealand but particularly the landing sites and place names for Kupe, the majority of the top of the South Island and West coast by Brunner, Aoraki / Mount Cook and other mountains and glaciers, the Bulmer cavern and Nettlebed / Stormy Pot cave, the wreck of the SS Elingamite and Kelly Tarlton's Sea Life Aquarium"--Publisher information.